Palm oil production, a major driver of deforestation in the humid tropics, especially in Indonesia and Malaysia, poses potential reputational risks to companies associated with it. Recognizing these risks, a growing number of firms have announced ambitious commitments to reduce or even completely remove deforestation from their supply chains. The zero-deforestation pledges of more than 50 companies leave the world awaiting the translation of commitments to change. One of the big challenges facing corporations in is tracing palm oil through large and complex supply chains to commercial product. By locating areas of production, companies can identify deforestation risk throughout their supply chains and then engage suppliers and monitor behavior to make progress. But for most companies, tracking palm oil to the farm where it’s grown is difficult, costly and time-consuming. An increasing number of processors, traders, and buyers have, however, begun taking the important interim step of tracing their supply chains to the mill level. A new data set launched on Global Forest Watch Commodities helps to globally map palm oil supply chains by showing the locations of almost 800 mills. Created by World Resources Institute, the traceability platform KnownSources, from FoodReg and several processors, traders, and buyers, the mill data provides a clearest picture of palm oil production publicly available. It creates new opportunities to analyze production areas and mills on a global scale, as well as to focus attention on new areas where palm oil production is having an impact on forests. Mill locations can indicate where palm fruit is processed as well as where palm plantations are located. Because it is highly perishable, fresh palm fruit must be processed within 24 hours of harvest, limiting plantation sourcing to an approximate 30-mile (50 km) radius around the mill, according to company estimates (though this may vary depending on available infrastructure, such as road density and quality). This means analyzing the area immediately surrounding a mill can reveal useful information about plantations that fall within its sourcing area. 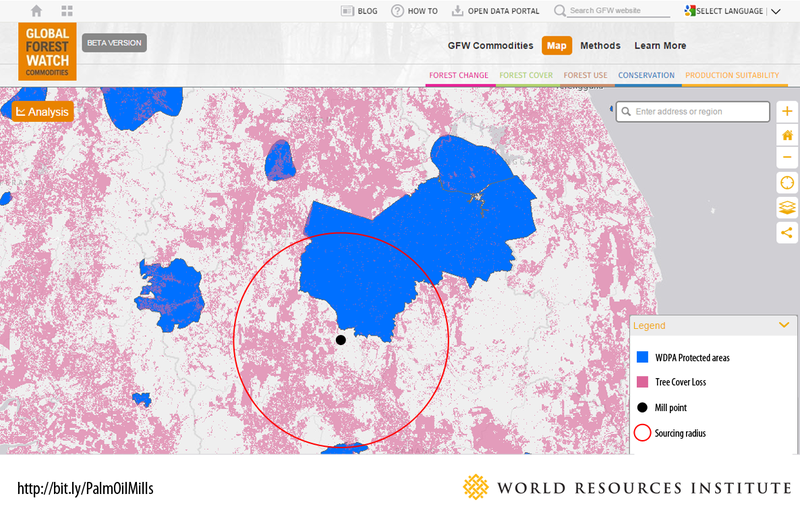 When used with other data layers on the Global Forest Watch Commodities platform, the new mill data set can help companies identify mills in environmentally sensitive areas. Figure 1. A mill’s sourcing radius (outlined by the red circle) contains oil palm concessions and overlaps both intact and degraded primary forest. Figure 2. A mill’s sourcing area overlaps Taman Negara National Park, Malaysia (included in the World Database on Protected Areas). This unprecedented data set consists of 782 palm oil mills, spread across 15 countries. As anticipated, the vast majority of these mills are found in Malaysia (50 percent) and Indonesia (44 percent). 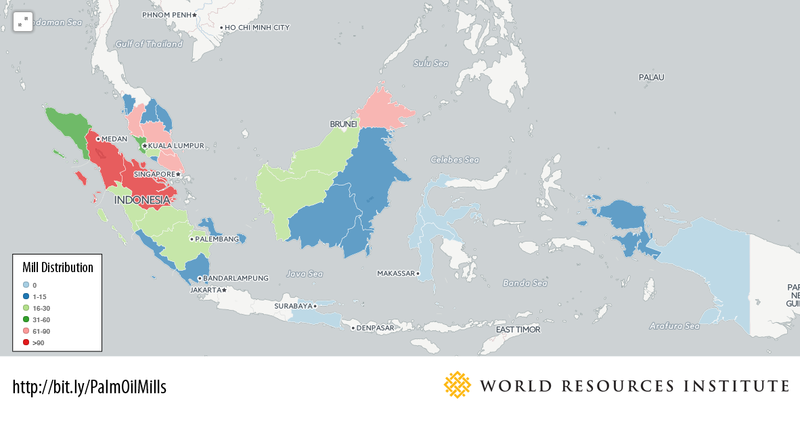 Production outside of the Southeast Asia region now accounts for 6 percent of the global market, as detected by WRI’s new data set, in countries as diverse as Ecuador, Colombia, Ghana and Sudan. Of these, Colombia possesses the most mills with just under 2 percent, or 15 mills, surpassing the Asian palm oil producing countries like Thailand and India. Within Indonesia, palm oil mills are largely concentrated in a few provinces. Nearly 13 percent of all mills included in the data are in the Riau province of Sumatra, Indonesia, which is also a hotspot for recent fires that caused severe haze and alarming air quality. Figure 3. Distribution of mills. 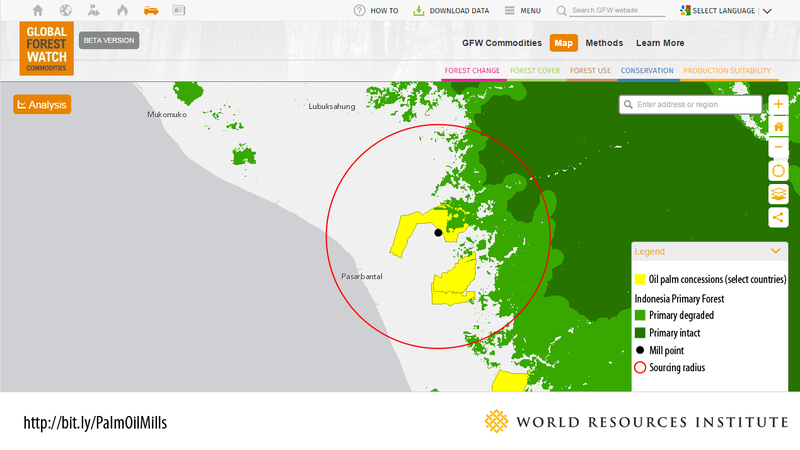 The new data represents the most comprehensive set of palm oil mills assembled to date. However, the total number of palm oil mills in the world is unknown and the data set, although large, only represents the mills within the supply chains of a handful of traders and buyers. It is difficult to determine what portion of total mills is captured in the data, but it is certainly a significant improvement in transparency and traceability for the palm oil industry. Continuing contributions will add to this data set as more companies realize the importance of traceability and good stewardship in a globally competitive market.